Char Dham Yatra 2019 - A Travel Guide To Char Dham! The Char Dham Yatra' literally translates to 'a journey through the four abodes or seats'. This includes visiting four of the most religious destinations in India, revered by Hindus. Some even call it a pilgrimage that every Hindu must undertake at least once in their life. Three of the spots are important to Shaivite and one to Vaishnavite history. The Chardham Yatra includes Badrinath, Dwarka, Rameshwaram and Puri. They are located in four distinct parts of the country so as to traverse the entirety of the nation, in spiritual pursuit. the summer months see the minimum amount of activity at these spots. Each spot rose to prominence in a different period of history, none less pious than the other. There's also a smaller circuit in Uttarakhand of four religious places (Yamunotri, Gangotri, Kedarnath and Badrinath) to visit known as the Chota Char Dham which is very popular among religious tourists. The Chota Char Dham route covers the span of Yamunotri-Gangotri-Kedarnath-Badrinath. If you wish to undertake a road trip to the holy sites, then a route map from Delhi will follow the course of Delhi-Haridwar-Barkot-Yamunotri-Uttarkashi-Gangotri-Guptakashi-Kedarnath-Badrinath-Rishikesh-Delhi. The total distance covered will be 1,607 km. Please keep in mind that driving in the hills is not allowed between 8:00 PM and 04:00 AM. So, you need to plan and look for stay options accordingly. The entire route is well-equipped with plenty of comfortable lodging options for every budget. A suggested detailed route map will look like the one below. A packed 2 Day itinerary will commence from Dehradun and cover the stretch of Yamunotri and Gangotri on the Day 01. Day 02 will be spent visiting Badrinath and Kedarnath, ending in the evening at Dehradun. If you opt for a more relaxed 06 Day tour, the route will span the same destinations covering Dehradun-Yamunotri-Gangotri-Kedarnath-Badrinath-Dehradun. But, the pace will be unhurried, with a halt of around a day at each spot. The journey starts from Dehradun between 6:30-7:00 in the morning and ends at the same spot at any time between afternoon to evening. Package tariffs range from INR 1,20,000 per person to INR 1,60,000 per person. Travel companies ask for a 50 percent advance at the time of booking. If due to adverse weather, darshan at any of the Dhams is not possible, a proportionate amount of money is refunded. Tariffs usually include all meals during the time span of the trip, lodging, local transportation, sightseeing, VIP temple darshan, pickups and airport transfers. These helicopter package tours usually don't include the cost of services like laundry, telephone, internet, travel insurance, monument tickets, camera fee at monuments or items like liquor, souvenirs and any other miscellaneous expenses which are not specifically included in the tariff. For availing these services or buying these items, travellers will need to spend extra money. Experiencing Char Dham yatra by helicopter is the fastest, most convenient way to complete the entire pilgrimage in a short time. If you are a religious devout who wants to visit the sacred quadrilogy of pilgrim spots but are on short of time, getting around on a helicopter is the ideal way of doing that. Even for regular who wish to experience the incredible and unparalleled beauty of the mountains within a compact time schedule, a helicopter journey is a way to go about it. Even though it costs a lot more than regular commute options, it is well worth the money spent in terms of both time and energy saved. The time span of a helicopter yatra will vary from 02 Days/01 Night to 06 Days/05 Nights and the cost will depend upon the duration of the trip and also the amenities provided by the tour company. While a 2 Day tour will be quick paced, packing a visit to all destinations within 2 days. The 6 Day tour will offer a leisurely journey covering all four pilgrim spots at a luxurious pace. The journey commences from the Sahastradhara helipad in Dehradun and the helicopter takes off quite early in the morning so be sure to reach the helipad well in time. Due to the high altitude, the weather is always cold. Be sure to carry appropriate and sufficient woollen clothing for all travellers. Travel light as tour companies allows only limited luggage per person on helicopters. The limit is usually 5 kg per person. It is advisable to carry your luggage in handbags as due to limited space, suitcases cannot fit in the helicopter. Always carry essential medicines with you as the pilgrim spots are situated at high altitudes and weather conditions may turn tough at unexpected times. The holy shrines of the hallowed Char Dham are situated at a considerable height with Yamunotri at an altitude of 3,291 metres, Gangotri at an altitude of 3,415 metres, Kedarnath at an altitude of 3,553 metres, and Badrinath at an altitude of 3,300 metres. Together these lofty spots make up the revered Chhota Char Dham pilgrimage route in Uttarakhand. While the steep altitude offers stunning, breathtaking views of mountain peaks and gigantic waterfalls brimming with foamy water, getting around are not easy. Trekking is the natural option for the physically fit traveller. But, for children, senior citizens, and other infirm passengers, getting around on foot is a challenge. Due to the difficulty of moving around in the challenging terrain, Palki and Pony services have gained a lot of popularity in the region. Gangotri and Badrinath are reachable by road and therefore driving up to these pilgrim spots is not a difficult feat. Reaching up to Kedarnath and Yamunotri becomes tougher because of non-accessibility by road. To reach Kedarnath, the needs to undertake a 16 km long trek from Gaurikund and to reach Yamunotri, a 6 km long trek from Janki Chhatti needs to be passed. To make it easier to get around, Palkis and Ponies have become a widely popular choice for tourists and pilgrims. A Palki ride will take place in a palanquin with four people carrying the passenger. Ponies also carry one passenger each. Charges for both Palkis and Ponies depend upon the distance, nature of the trip (one way/round), uphill/downhill journey, same/next day return, and weight of the passenger. For Yamunotri, the trek starts from Hanuman Chatti or Janki Chatti. For those unable to trek, Dandi, Kandi, and Pony services are easily available. Porter services are also available for carrying the luggage of, the charges for which will come around to INR 950 for weight up to 40 kg, including an overnight halt. For overnight stays, night halt is charged at an extra rate and the price ranges from INR 230 to 920 depending on the type of ride. Kedarnath temple is one of the highest temples in the country. It is located near the Mandakini river in Uttarakhand and houses one out of the twelve Jyotirlingas in the country. Dedicated to Lord Shiva, it worships the Lord as Kedar Nath, meaning the master of Kedar Khand, the name by which the region was known earlier. There is no road access available to the temple and it can only be reached through a tough, uphill 18 km long trek which starts from Gaurikund. Kedarnath is one of the holiest Hindu pilgrim sites and earlier completing a journey to the sacred temple was considered no less than an accomplishment for the religiously inclined. However, the tough journey is now much simpler because of the daily helicopter service which plies from the helipad in Phata village in Kedarnath. Some operators also offer a helicopter service from the town of Agustmuni in Rudraprayag. Devotees can visit Kedarnath temple and return the same day as helicopter service plies at regular intervals from Phata and Agustmuni helipads. 5-seater helicopters are operated by different tour companies. The last helicopter back to Phata leaves at 11:10 AM and those who wish to have an overnight stay at Kedarnath can choose to take this flight the next day. Even with a same day return flight, devotees get around 1:30 hours for darshan in the temple. Accommodation options are available at both Phata and Kedarnath. Cost for a round trip from Phata-Kedarnath-Phata comes to INR 6500 per person with extra applicable taxes. One way helicopter rides can also be booked subject to seat availability. A one-way ticket costs between INR 3,000 to INR 3,500 with applicable taxes. The best time to visit Chota Char Dham is during May-June and September-October. For helicopter journey, a trip can be planned in May-June and August-October. It is best to avoid a visit during the rainy season, especially in July as the weather is likely to turn rough and terrain adverse due to heavy and unpredictable rains in the region. Helicopter services are also non-operational during the month of July because of the stormy and rainy weather. In the 8th century, the great philosopher and reformer Shankaracharya laid down the foundation for Char Dham yatra which connects the four pilgrim corners worshipping and revering Lord Vishnu, the preserver god and Lord Shiva, the god of destruction. With one temple in each direction, the yatra circuit forms a perfect square with Badrinath and Rameshwaram on the same longitude and Dwaraka and Puri falling on the same latitude. This circuit is also known as the Real/Original Char Dham yatra and consists of 3 pilgrimages belonging to the Vaishnavite (Lord Vishnu's) belief and 1 pilgrimage in Rameshwaram belonging to the Shaivite (Lord Shiva's) belief. It is also one out of the twelve Jyotirlingas in the country. It is believed that undertaking this journey will absolve you of all sins that you have committed in your life. All four pilgrim spots have different legends associated with them. Belief is that Lord Vishnu did his penance at Badrinath. This is where Goddess Lakshmi saw him doing penance and offered him shelter by taking the shape of Badari tree. This is why the temple is known as Badari/Badri Narayan. The Jagannath temple in Puri is taken its name from Jagat Nath, which literally means Lord of the Universe. It houses the idols of Jagannath, Balabhadra and Subhadra which are made of wood from sacred trees and replaced every twelve years. Every year, these idols are taken out for the procession in the famous Rath Yatra. The Ramanathswamy temple in Rameshwaram is dedicated to Lord Shiva and houses the Lingam form of Shiva. Ramanathswamy means the master of Ram and this temple is named so because this is where Lord Ram offered his prayers to Lord Shiva to absolve himself of the sin of killing Ravan, a Brahmin. The temple houses two Lingams. A larger one brought by Lord Hanuman from Kailash and a smaller one in the sanctum which was constructed by Goddess Sita from the sand when Lord Hanuman encountered a delay when bringing the Lingam for worship. The Dwarakadhish temple in Gujarat is also known as the Jagat temple. The temple itself is dedicated to Lord Krishna who has the King of Dwaraka as one of his many names. It is believed that the temple was built by Vajranabha, the grandson of Lord Krishna at Hari-Graha, the place where Lord Krishna resided. A holy town in the Chamoli district of Uttarakhand, Badrinath is the northern leg of the Char Dham Yatra. It is at an elevation of 11204 ft and is alongside the banks of the Alaknanda river. Badrinath rose to prominence after an incarnation of Vishnu did tapasya there. Badri means 'berry' and nath means 'lord of' and the places got its name as at the time it was replete with berry trees. 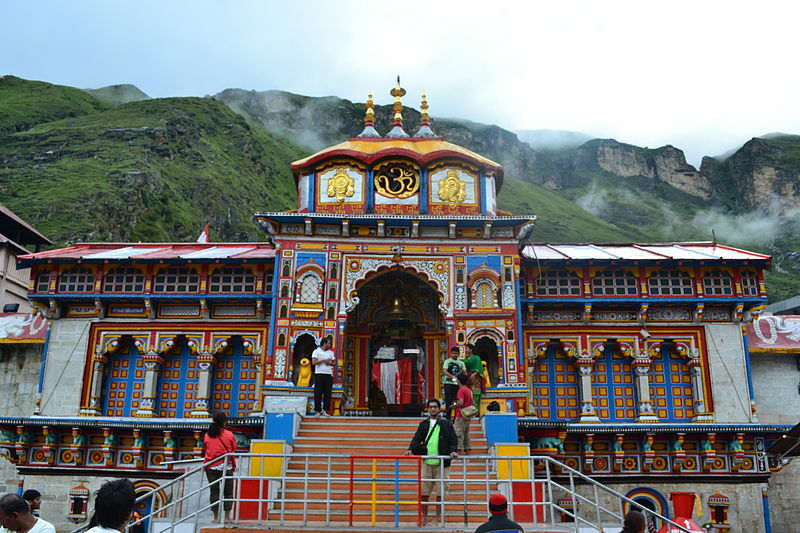 The Badrinath Temple is the main attraction of the town and attracts thousands upon thousands of devotees. Earlier, people would make the journey on foot but now, it's connected with various forms of transport. Connectivity: If you want to fly down, Dehradun is the nearest location to Badrinath. A helicopter can also be taken here. For taking a train journey, Haridwar serves to be the best connected and closest stop, from anywhere in India. Buses and personal cars and taxis can again be taken till Badrinath, especially if you are coming from a state closer to Uttarakhand. Best time to visit is from May to October, except during the monsoon season. A small town in Odisha, located 60 kms from the capital Bhubaneshwar, Puri is the eastern stop of the Char Dham yatra. Home to Lord Vishnu, the site commemorating him is the Jagannath Temple ? which dates back to the 12th century. The name is derived from the words 'jagan' and 'nath' which literally translates to 'Lord of the Universe'. The reverence and importance of the temple are substantiated by the fact that it's responsible for 80% of the economy of the town. It was invaded by Hindu and Muslim rulers through history and was even subjected to the Raj till India gained independence. The 'Rath Yatra' is also held every year. Connectivity : The closest airport is in Bhubaneshwar. Trains and buses connect this town to all parts of the country. Best time to visit is from October to April and you could also spend the new year here to start the year in a pious way! In your pursuit of piety, the small temple town of Rameshwaram in Tamil Nadu is the southernmost point of the Char Dham yatra. What's unique about this site is that it is a small island separated from the mainland by the Pamban Channel. According to Hindu mythology, this is the site from where Lord Rama built a bridge to go rescue his wife Sita from Ravana. To atone the sin of killing Ravana ? a Bramhin ? Rama and Sita built a lingam (symbol of Lord Shiva) to be worshipped here. Connectivity ? Madurai and Tuticorin airports are the closest to Rameshwaram and trains and buses ply regularly here, connecting it to different parts of the country. Best time to visit is from October to April. The western stop of the Char Dham yatra located in Gujarat is Dwarka. It is situated at the extreme western tip of the Kathiawar peninsula and is one of the seven most religious cities in the country. The kingdom of Lord Krishna, it is believed to have been the first capital of Gujarat. The Dwarkadhish Temple, in the heart of the city, was built around 2500 years ago in honour of Krishna. It was destroyed and then rebuilt in the 16th century. It is also said that those who visit the temple attain ?moksha? or liberation and hence it is referred to as Mokshapuri. Connectivity: The closest airport is Jamnagar from where you can drive to Dwarka. Dwarka is well connected by buses and trains with the rest of the country with train and bus stations there. One can also take their own private vehicles here. Best time to visit is any time during the year as the weather is always welcoming. Traditionally, the yatra is supposed to commence from Puri in the East, move clockwise through Rameshwaram and Dwaraka and conclude in Badrinath. However, for sake of planning and convenience, tour packages are customized and also commence from the city of Delhi, moving either through Puri or Badrinath and concluding again in Delhi. A typical journey lasts for 14 nights/15 days. A journey commencing in Delhi usually takes the following itinerary. To complete darshan in all Char Dhams, it is best to visit during May and October as the Badrinath temple is only open during these months. Always remember that you will be undertaking a journey through four extreme corners of India. The weather and climate will range from extremely cold to hot and extremely humid. Always carry a selection of clothes that are appropriate for all weathers. Carry woollens and heavy clothing for cold temperatures you will experience in Badrinath. High altitudes may cause breathing difficulties so do carry essentials medicines and first aid kits. Remember to pack light and airy clothes for hot and humid climates. Tip - Keep a check on the food you consume on the way as there have been reports of adulteration of food.